Abu Dhabi is the seat of federal government and the country’s capital. The United Arab Emirates (UAE) lies on the south-eastern tip of the Arabian Peninsula, bordered by Saudi Arabia to the south and west and the Sultanate of Oman to the southeast, while Qatar lies to the northwest. The UAE was formally established in December 1971, following an agreement between rulers of the seven emirates to form a union. These emirates are Abu Dhabi, Dubai, Sharjah, Ajman, Umm Al Quwain, Ras Al Khaimah and Fujairah. Abu Dhabi, the largest of the seven emirates to make up the United Arab Emirates, occupies over 80% of the country’s total land mass and features a coastline that stretches over 700 kilometres. The capital city, Abu Dhabi, is located on a low-lying island, featuring a Manhattan like skyline with tree-lined roads and landscaped parks and gardens. Sparkling waters of the Arabian Gulf, which surround the city, complete the scenic vista. 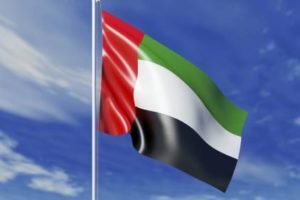 The UAE flag is the most common symbol of the seven emirates. But like any flag around the world, the colours aren’t just chosen at random; each represents a different aspect of the country. The colours green, white, red, and black are the Pan-Arab colours and represent unity between Arabs. Individually, white represents peace and purity, green represents prosperity and success, and red represents sacrifice and power, while black represents dignity and authority. Arabic is the official language of the United Arab Emirates. With the UAE’s position as a global commercial hub and top tourist destination, English is widely spoken. Visitors will find their way around easily, with all road and traffic signs in Arab and English, along with all necessary documents, store signs, news and even restaurant menus available in both languages. The Constitution of the United Arab Emirates declares that the country’s official religion is Islam. 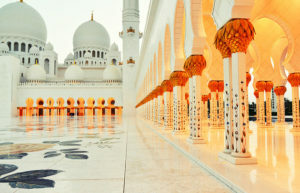 As a cosmopolitan country with residents and visitors from all around the world, the UAE Constitution also provides for freedom of religion, in accordance with established customs. While the melodic calls to prayer regularly sound from the countries countless minarets punctuating the cities’ skylines, nearly everyone can find a place of solace, in accordance with established traditions, to pray and worship as they see fit.